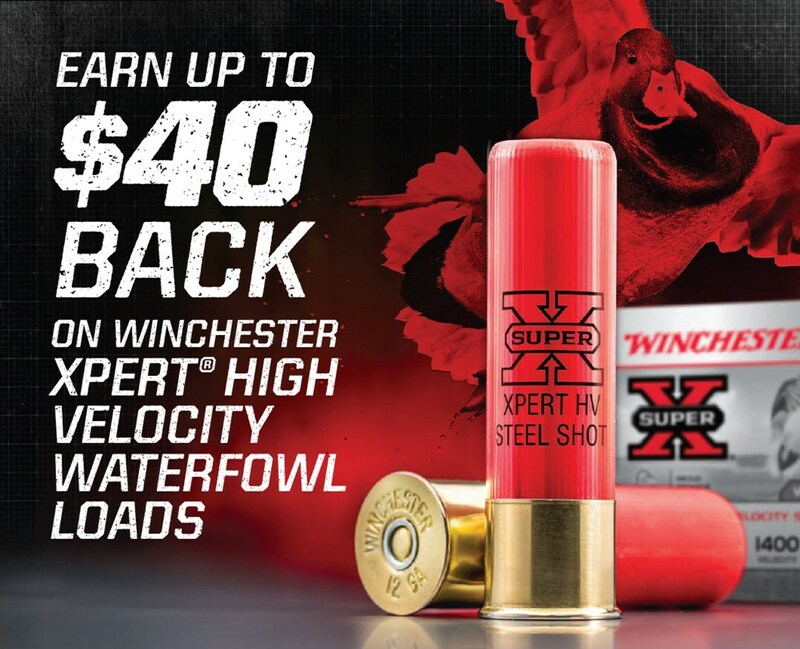 Between August 18, 2018 and December 31, 2018, earn $2.00 back for each box of Winchester Xpert® High Velocity waterfowl loads you purchase. Xpert® Game and Target loads excluded. Rebate is in the form of a Winchester Ammunition check. Minimum rebate amount is $16 (8 boxes of Xpert® High Velocity waterfowl ammunition). Maximum rebate amount is $40 (20 boxes of Xpert® High Velocity waterfowl ammunition). Offer is valid on qualifying purchases made between August 18, 2018 - December 31, 2018. Offer expires and all requests must be received by January 15th, 2019. Allow 6-8 weeks for delivery. Winchester is not responsible for lost or stolen mail. Void where taxed, prohibited or restricted by law.